Raheja developers launched India’s No.1 address “Navin Minar” in Delhi. It will become the tallest complex with only 125 units containing 3, 4, 5 & 8 Bhk apartments with all ultra luxury services. Price starts from INR 6 Cr Onwards. For more Call 8010 844 844. The Tallest towers in Delhi, They offer private swimming pool with every 4 & 5 BHK apartment. From high-rise apartments see the overlook views of Delhi reputed places like Rashtrapati Bhawan, ITC, Taj, Delhi Ridge and Connaught Place. In Delhi it will become first landmark that offered mixture of residential & commercial properties like Gold souk Jewelers, Cinemas, Shopping Mall, Food Courts, Showrooms and Luxury Residences in same complex. In India it will become first residences with 13 feet floor to floor height, making them bungalows in the sky. India’s highest helipad restaurant with World’s highest glass bottom pool. The elite residences would include the facilities and amenities of legendary 5 star hotels which only few can be able to call their own homes in New Delhi which are designed and structured at par and unbeatable with the luxurious 5 star hotel chains. To register Navin Minar Delhi, please provide us your contact details. Our representative will get back to you within 24 hours. The World’s Most Recognizable Address “The Trump Towers”, an address so powerful, a letter would reach you from any part of the world with just the Trump name. The Trump Organization having more than 35 years of experience in creating iconic landmarks and the Trump brand represent the most respected developments and most prestigious of addresses throughout the world. The Trump signature is synonymous with the gold standard, with superior quality, detail and perfection being delivered in every project. 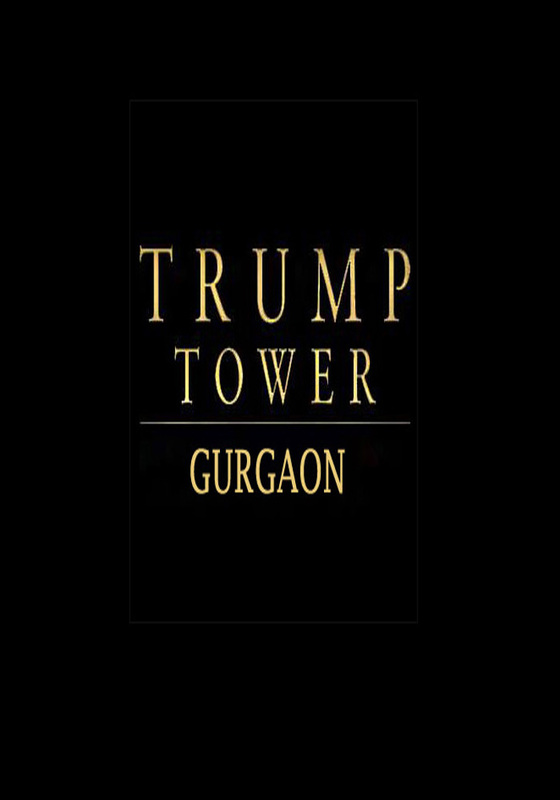 Now The Trump organization launched their last residential address in Gurgaon, India with the name of “TRUMP TOWERS DELHI NCR” India’s Global Beacon of luxury. This is the most premium 3 & 4 bhk residential projects in north India. In India, Delhi NCR region is one of the most popular residential & commercial hubs of the country, due to its location advantages and commercial importance. If you are willing to move to a luxurious residential apartment in Delhi NCR, you should have a look at Trump Towers Gurgaon. Trump Towers Gurgaon is one of the most promising projects developed by the joint venture of trump organization i.e Tribeca & M3M, this high rise residential estate comes with all the modern amenities you would expect in the heart of gurgaon. Fast transportation facilities, easy connectivity and elegant apartments define the benchmarks of this project. The residential complex covers a vast area of 75 acres. The 3 & 4 BHK apartments come with double height, where you can enjoy the best mixture of aristocracy and luxury. The homes have been customized for the high-end buyers. The social infrastructure around the area of the project is great, which makes it one of the most desired residential place of the country. When the apartments in Trump Towers Golf Course Extension Road will be ready to move, you will enjoy incredible views, iconic architecture, timeless design and world-class amenities. From commercial places to entertainment zones, every destination can be reached within a short time from the residential complex. As it is centrally located, the residents can get fast access to the shopping malls, multiplexes, restaurants and other important places. A large area of the complex is dedicated for public use. The residential estate comes with green zones, landscaped gardens and dedicated spaces for the children and senior citizen. The large clubhouse brings you the opportunity to enjoy quality time during your leisure hours. The apartments have uninterrupted water and power supply 24/7, besides upgraded security system. You can enjoy the swimming pool, gym, and various indoor and outdoor games. You can arrange social gatherings in the banquet, when necessary. Trump Jr. an Executive Vice President of the Trump Organization is scheduled to visit four Indian cities in last week of February 2018 to cover the sprawling Trump portfolio and also he will launch Gurgaon & Kolkata Trump Towers officially. He will also attend Global Business Summit in the national capital of India i.e. Delhi and the power packed schedule covers a wide-ranging list of activities. Trump Towers an international realty brand is ready to make his debut in northern part of India with the help of their joint venture M3M India and Tribeca Developers. Trump Organization, world most recognized address now launched in Delhi NCR entailing investments of Rs 1,200 Cr. During his visit, Donald Trump Jr. will visit four Cities of India. Trump Jr. will attend events in Delhi to celebrate the launch of Trump Tower Delhi-NCR. He will also be attending Global Business Summit in Delhi. The Economic Times will be addressing as a keynote announcer in Global Business Summit, which will be attended by 500 top CEOs, policy makers and innovators from across the world. Their Joint Ventures i.e. M3M India and Tribeca have reported sales bookings of over Rs 450 Cr within the first 25 days of soft launch. Initially, the three and four bedroom apartments are being sold in a price range of Rs 5 Cr. to Rs 10 Cr. Trump Towers Kolkata, which was launched in last of 2017, collected 70% of bookings for its residences only in two months. Kalpesh Mehta, Founder of Tribeca, comment: “We look forward to having Don (Trump Jr.) back in India again. What began off as a business strategy on the back of an espresso napkin, in New York, seven years prior, has formed into something we are both pleased with”. The Trump Organization has developed 4 luxurious projects In India; i.e. Trump Towers (Pune, Mumbai, Kolkata, Gurgaon) with their different joint venture. In January 2018, Trump Tower was launched in Gurgaon comprising 258 ultra-luxury apartments and being developed by M3M India & Tribeca developers. A healthy Mix of Commercial & Residential Developments. Godrej Properties Presenting Godrej Nature Plus, holistic Health Escape 2, 2+S & 3+SQ BHK Residences across sprawling acers at sohna road, Gurgaon with a very attractive price. The project is well equipped with all the basic & modern amenities to facilitate the needs of the residents. The site is in close proximity to aravali hills & various civic utilities. For appointments & site visit please give us call on 8010 844 844. Project developments, and featuring thriving infrastructure and a ‘walk-to-work’ advantage, Sohna Road makes for an attractive investment destination. It is strategically located to swiftly connect to all various destinations of Gurugram, including Cyber City Sohana Road, Golf Cource Road, MG Road, Udyog Vihar, Huda City Centre and Metro Stations of Sector 55-56. Further, by virtue of being located at Sohna Road and the foot hills of the Aravali Hills, the picturesque views around you will surely overwhelm you. The South of Gurugram is fast becoming a preferred residential destination. Especially for people who are looking for a well-connected location that offers the best of Gurugram lifestyle. A picturesque landscape, existing infrastructure are some of the factors that have made the South of Gurugram one of the fastest growing areas in Delhi NCR. • Sohna Road, the lifeline of South of Gurugram, will soon be an elevated road starting from Rajiv Chowk on NH 8. • Six lanes will be made available for traffic movement, beneath the elevated highway. Also, the Sohna Road is now being upgraded to National Highway 248A. • A 60 meter wide sector road is proposed to connect Golf Course Extension road to South of Gurugram as per the Sohna Development plan 2031. • The KMP (Kundli-Manesar-Palwal) Expressway passes through South of Gurugram and gives direct connectivity to Faridabad, Noida and other prominent locations of NCR. • This expressway also provides easy access to the industrial belt of NCR – IMT Manesar. 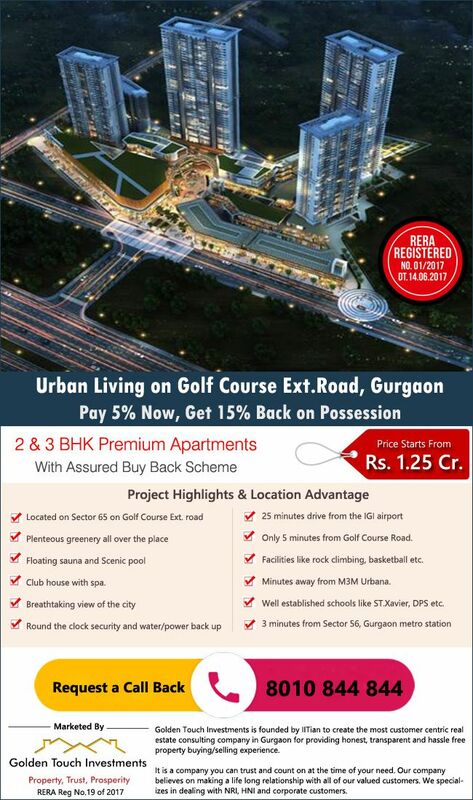 Godrej Properties is coming with their new project “Nature Plus” in 17 acres of large area in South of Gurgaon. Project Location is in heart of South of Gurgaon, Surrounded by Greenery and 80% open space, 13 elegantly designed mid rise tower with luxury specification. Godrej Nature Plus offers three sided open 2, 2+S & 3+SQ BHK Apartments with all modern Amenities like (Club house, Meditation Center, Sports Facilities, Swimming Pool, Power Backup, Day Care Center). For More details or Information visit: http://godrejgurgaon.com/ or call: 8010 8448 444. The project is well equipped with all the basic & modern amenities to facilitate the needs of the residents. The site is in close proximity to aravali hills & various civic utilities. Price starts from Rs.75 Lakh Onwards.